The first night we slept in the van it wasn’t as comfortable as we thought it might be, the rock and roll bed was a bit hard and there are gaps between each section as well as seat belt clips that dig in to your knees occasionally, the next time we stayed in the van we took a second duvet, one to lay on and one to cover us, this improved things so we concluded that a topper of some description should do the job. 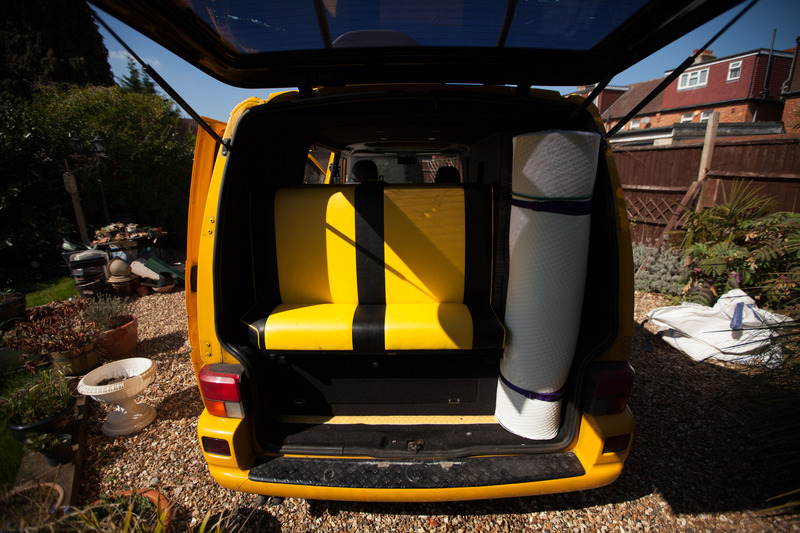 A friend of mine at work called Ben recently bought a T5 california and, as we are both now in the VW cool club we chat about things we’ve seen or bought for our vans, where we might want to take them and I mentioned to Ben about us looking for a topper. He’d recently read an article something along the lines of “Things I bought for my California” and one of these things was a Duvalay mattress. Duvalay are a british husband and wife team who came up with this idea of a kind of roll up sleeping bag with a memory foam mattress built in as they were fed up sleeping on uncomfortable beds in caravans, they pitched there business idea on Dragons Den and long story short, a dragon invested and the company was born, you can read all about it here. 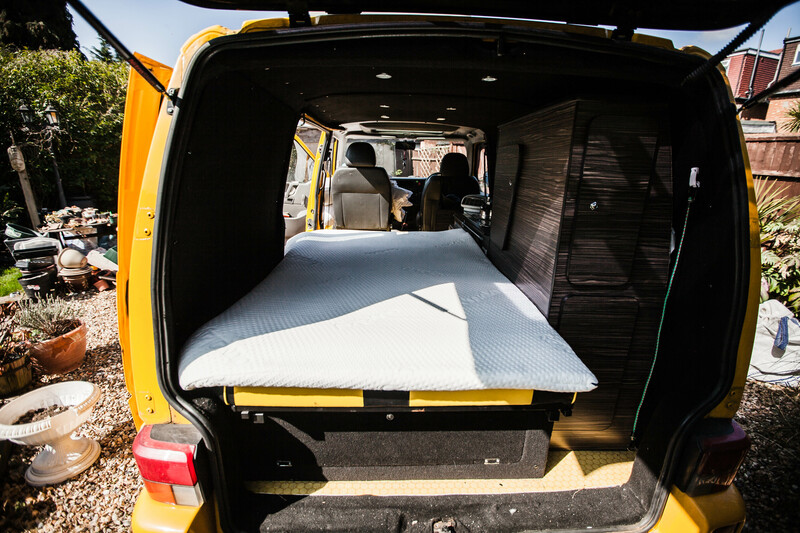 Ben bought 2 memory foam and sleeping bags for his van, tried them out and reported back they were great, a worthwhile purchase. 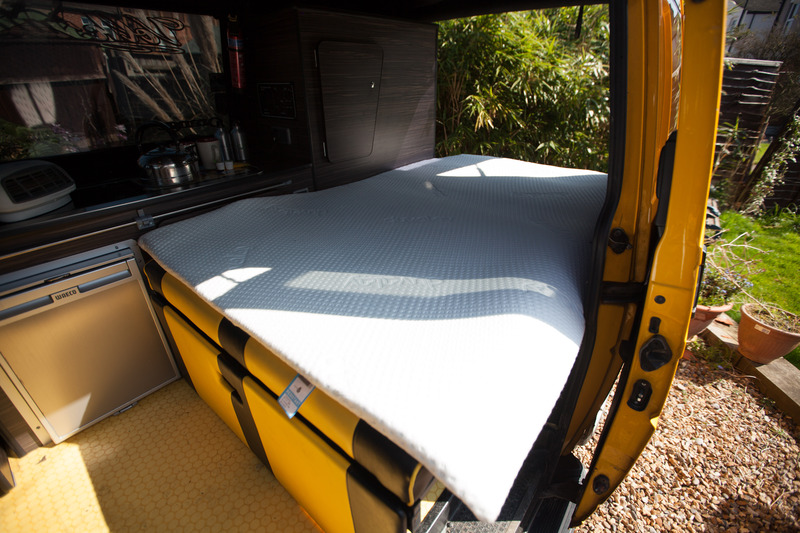 Over the last few years I’ve cost Ben a small fortune on my recommendations so it was only fair I shelled out on one of his, I didn’t get the sleeping bag version as I already had a duvet and pillows for the van, I bought the camper mattress topper which is exactly what I was looking for. As you can see it fits quite nicely on our 3/4 width RnR bed. We’ve also found a handy place to store it whilst in transit. We tested the topper out on a weeks trip in the van around the lake district and Scotland over easter, it rained, snowed, hailed and blew fierce winds for the entire trip, warm and pleasant weather it was not. To say it transformed our sleep would be the understatement of the year, it’s amazing the difference a simple memory foam topper makes both on the comfort and warmth front. When we camped in Plymouth around October last year, we both commented on the bed we were laying on being a little cold even with a sheet on and Lauren said it wasn’t very comfortable, we both agreed the Duvalay resolved those issues. It’s a great product and one I wouldn’t be without but, there are a couple of things i’m a little disappointed with. If you can’t afford the protective bag then at least give your customers the option of a darker zipped washable protector cover as the white one it comes with looks grubby within a very short space of time. You’r only other options is to purchase a dark zipped cover which will cost another £23.95 and the colour range they come in are similar to the kind of colours pensioners buy their cardigans in, i’m not a pensioner! In conclusion I think it’s a great product and I would recommend it to anyone who owns a camper, caravan or boat who says they have an uncomfortable nights sleep, I just feel you could get a bit more for the money you pay.